SF/F anthologies often provide uneven reading experiences, particularly those that try to be all things to all people at all times. Fearsome Journeys is the antithesis of that--it's well-curated, precisely calibrated and almost uniformly good, and as such, it makes a strong statement on what this oft-derided genre can accomplish. The volume begins with a healthy dose of sarcasm and humor. Scott Lynch's “The Effigy Engine: A Tale of the Red Hats” follows a troupe of mercenary wizards in a world where magic and gunpowder coexist. It's a characteristically swashbuckling tale, full of wit and Baron Munchausen-style absurdisms. Saladin Ahmed's “Amethyst, Shadow, and Light” follows, and reads as a tongue-in-cheek deconstruction of sword & sorcery tropes, whether of the Robert E. Howard or Advanced Dungeons & Dragons Second Edition variety. Both are extremely likable and a pleasure to read. Humorous/witty approaches in fantasy don't always work quite that well, though. Glen Cook's “Shaggy Dog Bridge: A Black Company Story” will amuse fans of the series, but its charms will likely be lost on readers who aren't already familiar with the characters, their eccentricities and the gallows humor of the Black Company. “One Last, Great Adventure” by Ellen Kushner & Ysabeau Wilce is a generally successful attempt to subvert fairy tale tropes, but since this has been done before--a lot--it doesn't feel terribly fresh or exciting either. And that's still a good deal more than I can say for “Sponda the Suet Girl and the Secret of the French Pearl” by Ellen Klages, which centers on a practical joke played by smart people on a dumb and gullible mark. Klages is aiming for clever/witty here, but there's an implicit condescension that just rubbed me the wrong way. It was easily my least favorite entry in the anthology. Fearsome Journeys' best moments come when its authors capture the genre's potential for wonder. Trudi Canavan's "Camp Follower" was a revelation--I'd never read anything by her to this point, but will now make a point of reading absolutely everything I can get my hands on. The story of a captain in a victorious army, who has come to share his tent with a mysterious, otherworldly woman, "Camp Follower" is, in turns, a meditation on power, oppression, loss and mortality. It's one of the best fantasy stories I've ever read. Daniel Abraham's "The High King Dreaming" is nearly as good--the mesmerizing story of a king existing in a dream-like state between death and living. He watches over his daughter as she ascends the throne and faces various challenges, while he waits for the moment when she truly needs him, the moment when it is foretold that he would return to save her. Though it can be read as straight fantasy, it's also an allegory for the joy and pain a parent goes through as their child reaches adulthood and seeks out their own path. If I were the kind of person who could nominate for a major award, I'd have two plausible choices from a single anthology--a startling accomplishment for editor Strahan. Fearsome Journeys presents several other high quality stories cut from the same cloth. “Leaf and Branch and Grass and Vine” by Kate Eliot is a characteristically elegant tale, the story of a peasant woman's quest to save a kingdom from a dark conspiracy. Though the narrative form may be familiar, Eliot's empathetic gaze and capacity for vivid, atmospheric description set it apart from the pack. Jeffrey Ford's “Spirits of Salt: A Tale of the Coral Sword” is equally good, and a dense and elusive thing, full of the complexities and ambiguities I associate with Gene Wolfe. As with the best of Wolfe's short stories, it begs to be re-read. I had similarly high hopes for K. J. Parker's entry, but found myself mildly disappointed. Perhaps unfairly, I expected something on the level of "Amor Vincit Omnia" or "A Small Price to Pay for Birdsong." While "The Dragonslayer of Merebarton" never quite reaches those heights, it does end on a haunting and deeply personal note that mostly makes up for the fact that I didn't really enjoy getting there. "Forever People" by Robert V. S. Redick suffers from the opposite problem--it tantalizes, but never quite delivers on its promise when all is said and done. The fact that Fearsome Journeys tilts so heavily towards "humor" and "wonder" stories marks Elizabeth Bear's "The Ghost Makers" as a bit of an oddity. Not on account of quality (it's very good), but because it's the most traditional sword & sorcery tale of the lot. Action follows an unlikely pair of allies both seeking the death of the same malefic wizard. "The Ghost Makers" takes place in Bear's Eternal Sky universe, same as recent novels Range of Ghosts and Shattered Pillars. As such, the story highlights the richness of that world, as well as the evocative prose on display in both novels. Yet it doesn't require the foreknowledge that Glen Cook's entry does. It should appeal equally to fans of the series and those encountering the world for the first time. 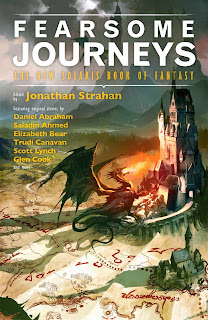 With so much on offer and so few drawbacks, Fearsome Journeys stands out as the best fantasy anthology to hit bookshelves in ages, and showcases the genre's potential for explorations of the human condition. Though it will certainly appeal to established fantasy readers, it would also serve as an ideal introduction to short form fantasy for the uninitiated. Highly recommended. Bonuses: +1 for the stories that were genuinely funny; +1 for the stories that captured the elusive sensawunda. Penalties: -1 for the stories that didn't quite live up to the best ones.